It’s with great pleasure we can announce the Italian premiere of Princess Pumpalot: The Farting Princess with a stage production, based on the original text of the book, taking place in Northern Italy in June 2015. The production will be performed by the Benvenuto Players - an English speaking Youth Theatre Group run by Theatre Producer Alison Parnell who will also be directing the show. The Benvenuto Players are well-known among the foreign community in the area and have been delighting the public with pantomimes and classical theatre for almost 30 years. A flavour of the stage show. The trailer was filmed and edited by Anthony J Frame. We are the proud owners of a newly written stage adventure. It is called Princess Pumpalot The Farting Princess & Guffy in the Quest for the Super-Bean (by Robin Mitchell). On Saturday 7th February 2015, Princess Pumpalot creator Robin Mitchell and Cameron Pirie (who appeared in the 2014 stage show) will be reading from Princess Pumpalot: The Farting Princess at Danderhall Library in Midlothian. The event - a fun-packed mix of costumes, props and funny voices - is FREE and commences at 11am, lasting for approximately 1 hour. Come along and join in! Love Your Library Day is a week long catalogue of events to celebrate libraries and reading in Midlothian. We hope everyone has a fartingly good Christmas and a very Happy New Year. FROM: Princess Pumpalot, The King, The Queen, Geoffrey The Giraffe, Guffy, Prince Niceavia and even.... Prince Nastavia and The Low Flying Gnomes. See you in 2015. #Fart2014 moves into #Fart2015. We had a blast at Mayfield Library as part of Book Week Scotland. Book Week Scotland is a week-long celebration of books and reading that takes place every November. This year it will take place from Monday 24th – Sunday 30th November 2014. 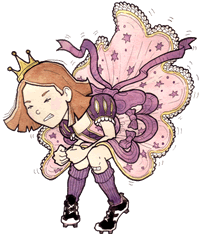 Princess Pumpalot: The Farting Princess is to be part of Book Week Scotland 2014. Hollywood actor Kevin McKidd (star of Grey's Anatomy, Rome and Trainspotting to name only three) lends his support to Princess Pumpalot: The Farting Princess . Kevin, who many moons ago worked for Edinburgh's Witchery Tours, has always kept up with his friends in the capital. On a recent flying visit to Scotland, we met up with Kevin and he happily posed with a copy of the book. We saw this show with a 4 year old and 6 year old. Absolutely loved it, the children are still talking about the Princess and her farts! There are lots of opportunties for audience participation, it's a real fun show. Great cast. lovely story and fabulous acting. The Princess and Guffy were our favourites. I would thoroughly recommend this show. What an absolute delight! Fantastic show for all Ages extremely Entertaining and an absolute Joy to watch! Princess Pumpalot is a star! 5 stars! We join Princess Pumpalot on her 16th birthday when she discovers she needs to find the magic beans so she can protect the castle from the gnomes and what better way to do this than with farts.